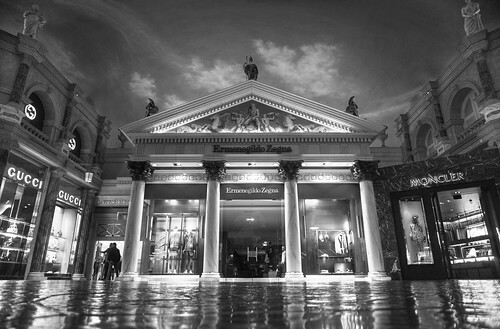 I was roaming around at the Forum Shops at Caesars, an upscale mall in the Caesar Palace casino in Las Vegas, Nevada. The mall is modeled after the old Rome at the time of Caesar, and has a fake sky. I was more interested in hunting around with my camera than shopping. I processed a balanced, a soft, and a paintery HDR photo from a RAW exposure, merged them selectively, carefully adjusted the color balance and curves, then desaturated the image. I welcome and appreciate constructive feedback. Thank you for visiting - ❤ with gratitude! Fave if you like it, add comments below, like the Facebook page, order beautiful HDR prints at qualityHDR.com.